Searching for a toy poodle puppy for sale? Trying to locate a top breeder of a toy poodle, teacup poodle, or miniature poodle puppy? What colors do you seek, a rose red, mahoghany red, apricot, red, brown or black poodle puppy? Is your goal to find a breeder of high quality or show quality poodles, or are you just looking for any kind of puppies for sale? 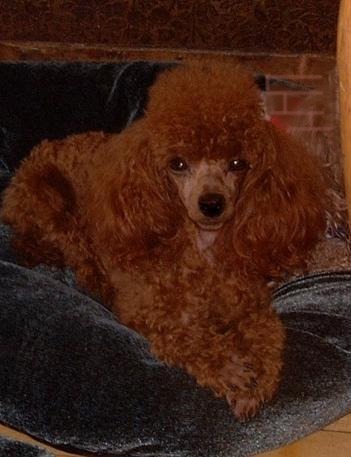 Rennie's Rose Red Poodles is a breeder of show quality poodles, producing high quality toy, miniature and teacup poodle puppies. We provide rose red, mahoghany red, apricot, red, black, or brown poodles each with a five-generation pedigree. Welcome to Rennie's Rose Red Poodles featuring High Quality Rose Red Toy Poodle Puppies ! *You have reached the web home of a poodle breeder of show quality poodles and high quality toy, miniature and teacup poodle puppies. We produce the deepest of rose red, mahogany red, apricot, red, black, or brown poodles and each one is presented to the new owner with a five-generation pedigree. *Reaching the web home of Rennie's Rose Red Poodles likely means that you are searching for a toy poodle puppy for sale. Further to your arrival here it would indicate that you have been using the Internet very specifically to identify a top breeder of a toy poodle, teacup poodle, or miniature poodle puppy! We believe that your quest can end with Rennie's Rose Red Poodles! *At this point you may have decided that you prefer one of the primary colors; and seek a rose red, apricot, red, black or brown poodle puppy. Surely your goal is to find a breeder of high quality or show quality poodles, but then again might be seeking any kind of puppies for sale. *No doubt you have discovered that the Internet today features a host of miniature poodle breeders, toy poodle breeders, and show quality poodle breeders that have definitely made their existence known. So how do you distinguish which poodle breeder is best, is there a way to establish a poodle breeder's credentials? *The majority of poodle web sites are unable to tell you much about the integrity of poodle breeders. Each site will go on and on about how great they are as poodle breeders, and certainly none of these breeders would ever admit to being unscrupulous. Further a poodle breeder is not likely to tell you when their kennels may be overcrowded, and surely they would stop short of indicating if they are operating a puppy mill. *So how do you identify the poodle breeder that will provide you with a wonderful new puppy as a member of your family? Well, your chances of finding a high quality puppy improve somewhat if the breeder mentions puppy registration with the American Kennel Club, AKC, but perhaps more assuredly with the United Kennel Club, UKC. *Pedigrees are what distinguish the poodle champions and we offer a five-generation pedigree with every one of our puppies. On that pedigree, the champions in the background of that puppy will tell a lot. The more champions that are listed, the better chance exists that this puppy is of very high quality. *Perhaps an attribute that is most often overlooked by many breeders is the temperament of a puppy. Of course each of our puppies is well socialized, but each of them demonstrates their own unique personality. Matching that little personality to you as the new owner is one of our highest priorities and we are proud of our success. *Rennie's Rose Red Poodles believes another important criteria is that a breeder must fully stand by the quality of the puppy. If they do, the odds improve greatly that you would get a truly great poodle puppy. We at Rennie's Rose Red Poodles stand behind the quality of our puppies and believe our warranty can provide that margin of comfort you need in making your selection! *Finally we would tell you that you should not even take our word for our ability to raise high quality or show quality puppies. Instead there are scores of satisfied customers that can speak for us and we would be pleased to refer you to any of them. Additionally every one of the veterinarians that have helped us maintain the health of our little friends can also attest to the quality of our puppies and our scrupulous efforts to keep them healthy and happy. *Hopefully your visit to Rennie's Rose Red Poodles will help you locate that special puppy that is destined to become the poodle champion of at least your family! ....and by the way, if you get a chance, drop in and look at West Coast Poodles, my daughter Marsi also is a breeder but she specializes in miniature poodles. Thank you for dropping by, and welcome again to Rennie's Rose Red Poodles web home, your search for a high quality poodle puppy can end right here! Rennie's Rose Red Poodles if you have any questions about poodles! © All content contained herein is is protected by state and federal copyrights as may be applicable! Reproduction or use of any kind is only possible with the express written consent of the author or Rennie's Rose Red Poodles.